Established in 2003, National Preparedness Month is held each September to increase public awareness about emergency preparedness. 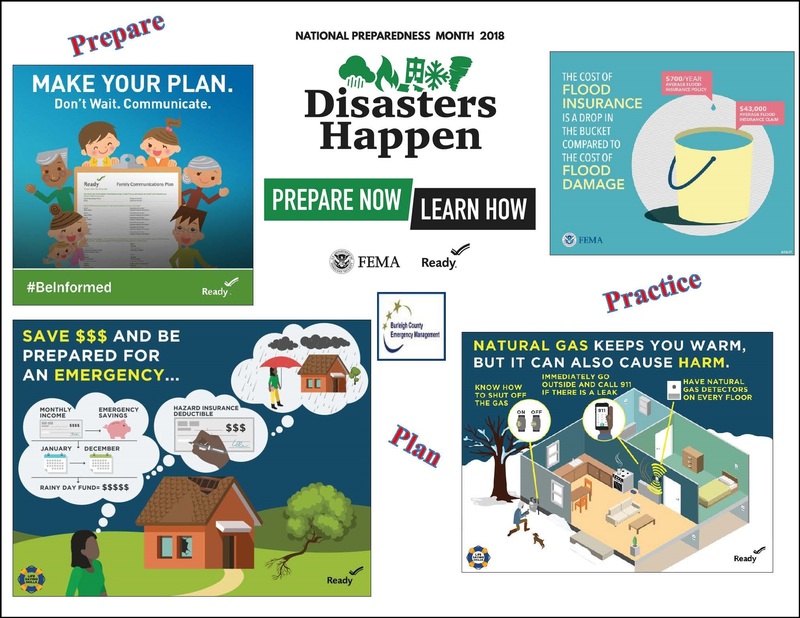 National Preparedness Month (NPM) aims to educate and empower Americans during NPM and throughout the year to prepare for and respond to all types of emergencies. Click here to access the web-based training. 2018 National Preparedness Month: Disasters Happen. Prepare Now. Learn How. Know basic home maintenance to protect your family and home. Learn how to turn off utilities like natural gas in your home. Learn CPR and how to use an AED: www.ready.gov/safety-skills. You may be the only help until help (first responders) arrive on the scene. Insurance is the first line of defense; however, do you know what your policies really cover? Generally, most homeowners' and renters' insurance does not cover flood damage. which is only offered through the National Flood Insurance Program. Over 40 percent of all Americans don't have $400 in savings according to the Federal Reserve. How will you pay your bills if a disaster strikes? Disasters don't plan ahead, but you can-start setting aside a small amount from each paycheck for an emergency fund.